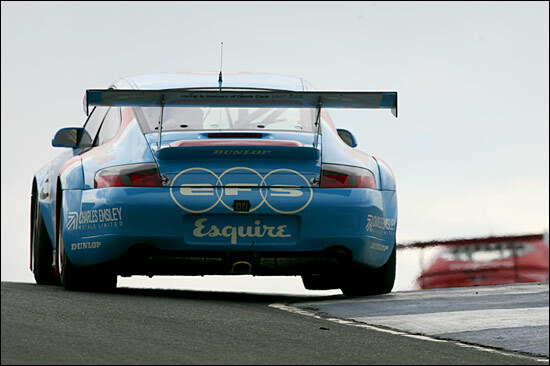 Fresh from a second in class finish at the Silverstone round of the FIA GT Championship, it was back to the British GT Championship for Embassy Racing and a trip north of the border to Knockhill, just outside Edinburgh. Two years ago Neil Cunningham, spurred on by the spirits of his Scottish ancestors, won a historic Cup Class victory in the Morgan at this tight and twisty little circuit – he went even better this time, helping Embassy Racing secure its first ever outright victory. 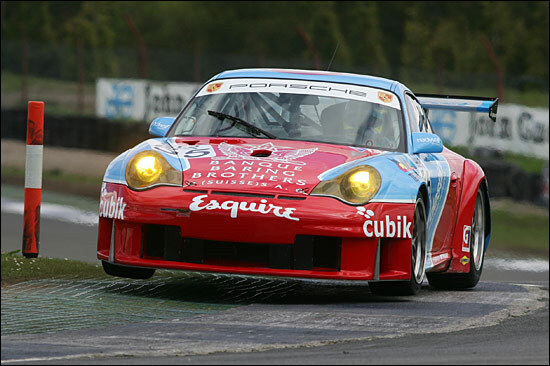 Leading up to Saturday’s lunch break, “4” had been the predominant figure, that being the Embassy Porsche’s final position on the timesheets for the practice and both qualifying sessions. 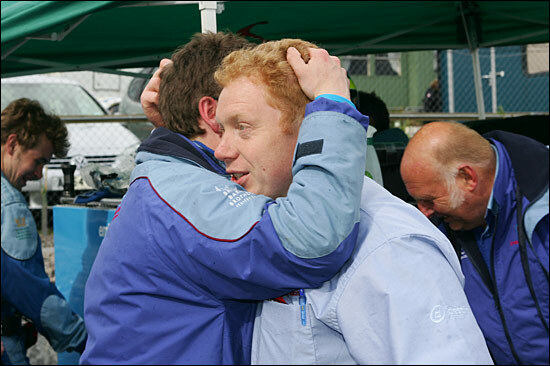 This was “slightly disappointing” to Jonathan France, who hoped that the curse of the “4” would be washed away with the arrival of the typical Scottish downpour which immediately followed the second qualifying session. 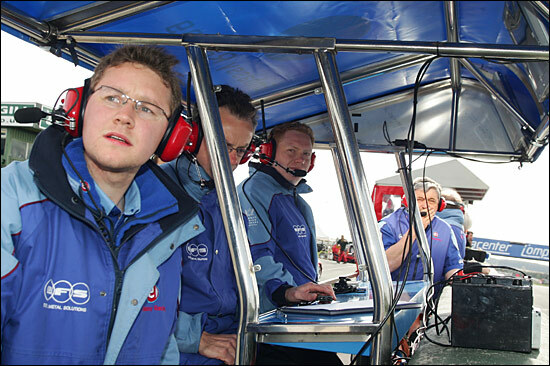 When the session resumed, Neil had another brief stint, handing over to Ben Collins with half an hour to go. Ben had a steady session, building to post a 51.652 by the end, exactly 6/10ths down on the quickest time. Unfortunately, Mullen had by then resumed the normal ‘red-cars at the front’ service, so the finishing order was Ferrari, Ferrari, TVR, Embassy Porsche, Eurotech Porsche, TVR, Eurotech Porsche. Ben Collins’ view was that “the car is really good, but I don’t think we will know where we are until qualifying, when we both get some new tyres. I locked up into Seat towards the end of the session and went off a little bit.” A little bit perhaps, but enough to give the Embassy boys a job to do before qualifying – fitting a new splitter. Both qualifying sessions were real tactical battles, with drivers trying to create space ahead of them by slowing at the end of the lap, ready to attack on their next. Ben’s session was particularly difficult, and it was only towards the end that he managed his best of 51.501. He provided some early spectacle however, by making things difficult for a charging Kirkaldy, the pair dicing around the lap, as if Ben was telling the Scot not to expect an easy ride on his home turf. Ben’s session ended with a more familiar pattern, behind an all Ferrari front row and once again behind the sole surviving TVR. The margin was however rather more, Kirkaldy making the success ballast look rather redundant by finishing six-tenths ahead of anyone else. As the cars took to the grid, all the focus and interest was on the tyre choices. Representatives from the full range of wets, intermediates and slicks adorned various cars. Embassy’s choice, based on Ben’s recommendation, was to comply with the minority and go for slicks, but of course it was Neil who would have to cope with treadless tyres on a greasy track. The ”three getting away” were a storming Jordan, demoted Kinch and hungry Hughes, all on inters and determined to make the most of them whilst they would still hold an advantage – it wouldn’t be long. 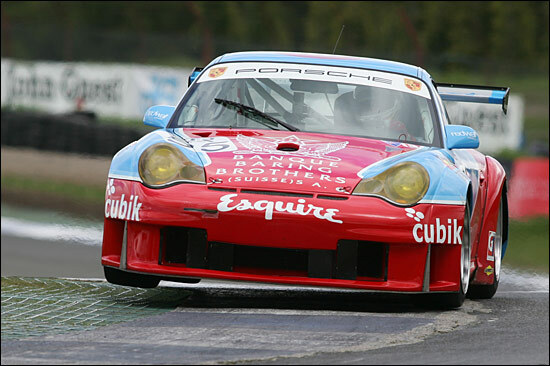 Also making the most were Chris Niarchos in the second Scuderia Ecosse Ferrari and David Jones in the second Eurotech Porsche. Without grip, Neil was powerless to defend their advances at the Real Radio hairpin. By as early as lap four however, the track was drying fast, those slick tyres were warming up and starting to pay dividends and with the leading trio’s initial savage battle resolved, all six leaders were neatly strung out into a tight line. Embassy were no longer going backwards, they were holding station. Within a lap, Neil was ready to show just how good the tyre choice had been. An excursion from Patrick Pearce at Scotsman’s meant fifth was handed to Neil, but he also managed to nab fourth from David Jones out of Clark and had a good look along the outside of Niarchos’ Ferrari into the chicane. 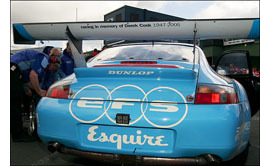 The Embassy Porsche was looking exceptionally racy. Both Ferraris succumbed in swift succession and Jordan’s lead was instantly decimated, Cunningham taking the lead into the chicane on lap 10. By the end of the same lap, Neil had pulled out a convincing lead of four seconds and by lap 13, the other slick shod cars were causing surprises – Bryce Wilson taking RJN’s Nissan 350Z into second overall and Dimitris Deverikos, miles ahead of the rest of the GT3 runners, was challenging the struggling GT2 Ferraris. As soon as the pitstop window opened, Jordan and Niarchos dived in, desperate to rid themselves of grooved rubber and get the sticky slicks they had yearned for over the last 22 minutes. This put some pressure on Ben when he finally took over from Neil, but at least he had inherited a decent lead. By the time Collins emerged onto the circuit, he was 12 seconds ahead of Kirkaldy but the Scot was on fresh tyres and on a charge that was taking two seconds a lap out of Embassy’s lead. “The boys on the wall did a great job though, telling me when I needed to push and when I didn’t.” Right now, they were telling him to push, and the response was the fastest Embassy laps of the race, helping Ben hold the gap to Kirkaldy more or less steady. There was a dash more rain with 20 minutes to go, but the showers did not become strong enough to disrupt the order or undermine the superiority of slicks over intermediates. “It’s always worse when you are leading into a shower though,” said Collins. “When you are on slicks and you are the first one to meet a slippy track, it is always stressful.” Warren Hughes in the LNT TVR had closed on Ben and was keen to un-lap himself, so #55 let him go, not wishing to risk a misunderstanding or an unkind nudge, especially with Kirkaldy less than ten seconds behind and very much in pursuit mode. “The TVR went off shortly after unlapping himself though and there were about three cars that had basically come to a grinding halt on the track when I came across them. They all just decided to get going again, not bothering what was coming up behind and I had nowhere to go.” Collins was looking left and right on the run down to the hairpin, but the bluff rears of the TVR and Nissan were forming a rolling roadblock, gifting Kirkaldy a full two seconds. These were tense times in the Embassy camp. Neil Cunningham and the rest of the Embassy crew could not believe how long that last sub-minute lap could possibly take, but it all came good in the end. 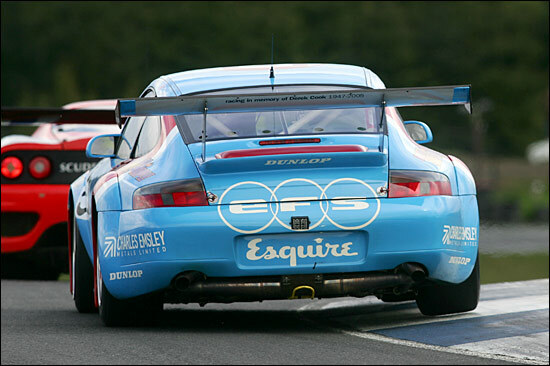 As the blue and red Porsche swung through the hairpin that one last time for one final blast up the hill, Jonathan France realised that his new team, after taking just three race starts, had won. The mood in the Embassy camp after this great result was not perhaps what you would initially expect – there were plenty of smiles of course, and the champagne glasses were being distributed very quickly indeed, but there was a sense of meeting expectations rather than the achievement of a remarkable result. That is the atmosphere that anyone who knows how much Jonathan France is committed to winning would expect.